For the Month of December I will be sharing DIY gift ideas and I'm super excited to start off this series with a guest post by Jennie from Shape of a Spoon. Jennie's shop 3three by 3three is lovely and elegant. I want her to sew all of baby Maria's clothes, but mostly I just want her to make me this skirt and I guess I wouldn't mind having a ruffle apron in my size as well. Check out Jennie's tutorial on how to make a perfect foodie present for a little girl this Holiday season. 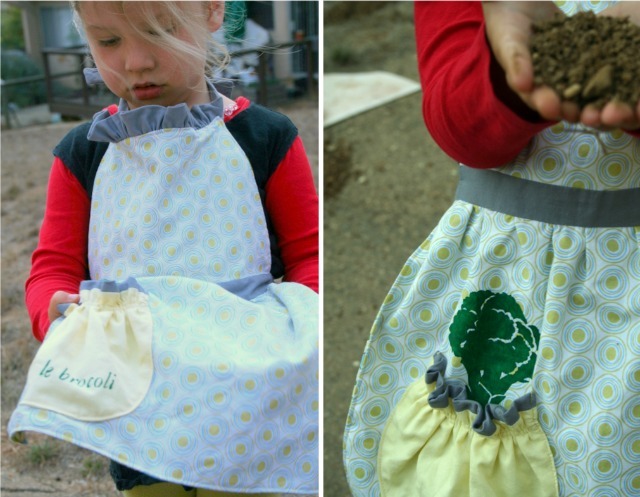 I created this apron for my 3 year old. She always rushes to help anytime we enter the kitchen. I wanted to give her something inspiring to wear while creating culinary masterpieces (or just hanging around). 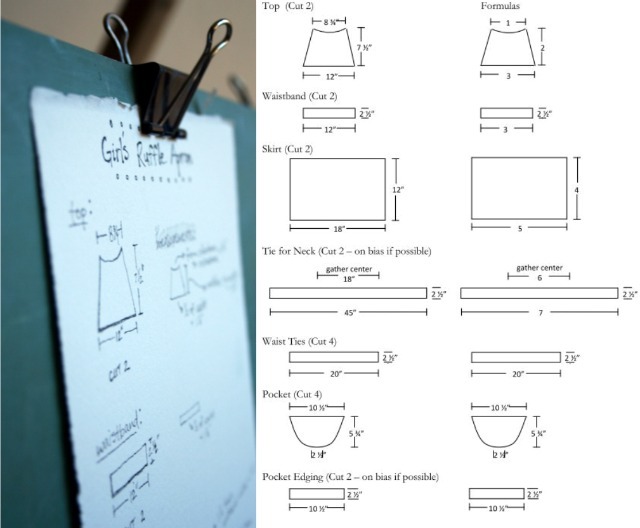 2) neckline to waist, add 1 1/4"
3) 1/2 of waist, add 1 1/4"
4) waist to knee, add 1 1/4"
5) 1.5 times measurement (3), add 1 1/4"
I often prefer to sew reversible clothing. It's more versatile and has a more finished look, not to mention all the hair I don't have to pull out as I try to make my hems look decent. The wonderful thing about sewing for children is how little fabric you need, so adding another layer isn't necessarily cost prohibitive. 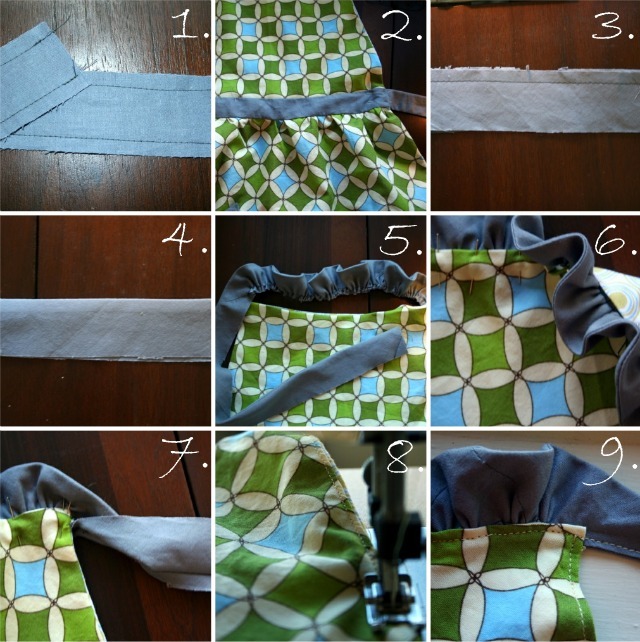 I chose two main fabrics for each side of the apron, a contrasting fabric for the ties, waistband, ruffle, and pocket edging, and another contrasting fabric for the pocket. It was fun finding fabrics that all worked together so well. Start by cutting out all the pattern pieces. If you have one, this is the perfect project in which to use a rotary cutter and mat, as most of the pieces have straight edges or are long strips. 1. Pin one pocket and pocket edging, right sides together, and stitch. Press seam. 2. Pin second pocket to first, right sides together, and stitch. 4. Turn pocket right side out and press. 5. Turn pocket edging down about 1/4" and press. 6. Turn down pocket edging once more, making sure that it falls below the seam on the opposite side. Press. 7. "Stitch in the ditch" (right on the seam) on the front of the pocket. 8. The back will look like this. Make sure you caught the entire reverse side of the pocket in your hem. Pick out and restitch if necessary. 9. Using a basting stitch, sew about 3/4" from the top of the pocket (make sure to back stitch at the beginning of the seam, but not the end). Pull on the loose thread to evenly gather the top of your pocket until it forms a pleasing looking horseshoe-like shape. 10. Using a normal length stitch, sew two parallel seams over top of this one. 1. 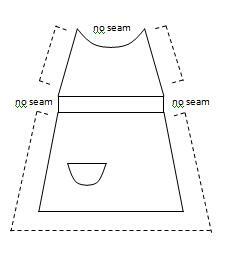 Position and pin the pocket to the apron skirt off-center, as pictured below. 2. Top stitch close to the edge (about 1/8"). 3. 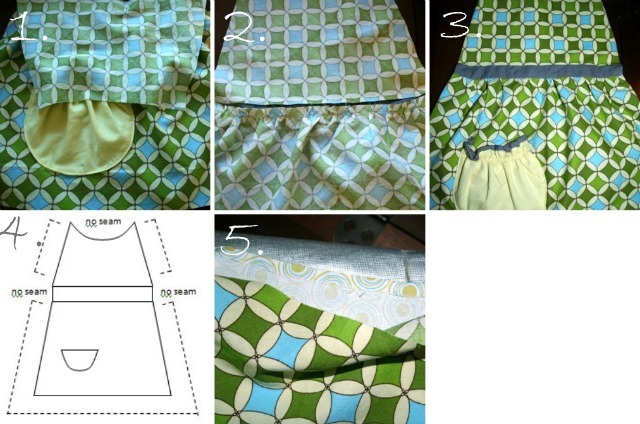 Using a basting stitch, sew along the top of the skirt. 4. 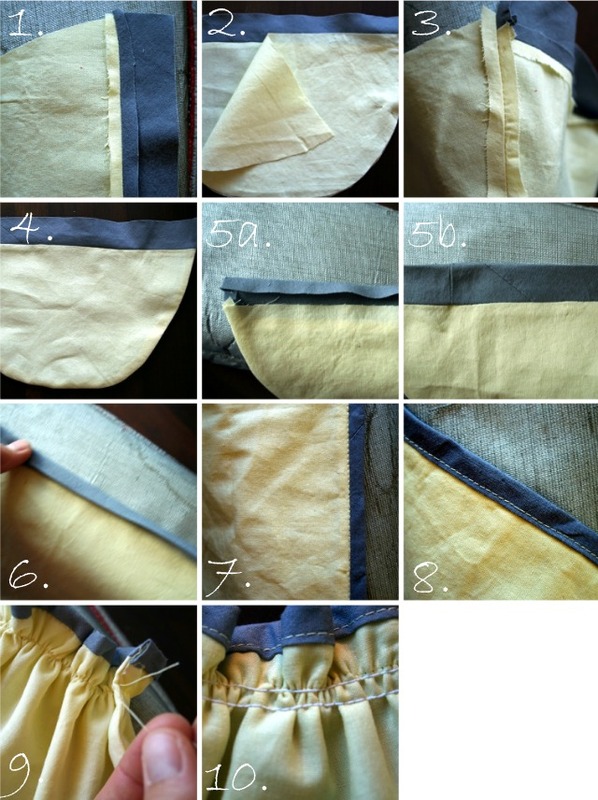 Gather evenly until it is the same length as the waistband. 5. Pin skirt and waistband, right sides together, and stitch. 1. Pin apron top to waistband, right sides together, and stitch. 3. So this is what you'll have - one side of your apron, no ties at the waist or the neck. Now repeat all the previous steps to assemble the reverse side of the apron. 4. Pin the two finished pieces, right sides together, and stitch according to the diagram. Make sure you don't stitch all the way to the edge of the apron top or to the edge of the waistband so you have room to insert the ties. Turn entire apron right side out and press. 5. Turn down the top edges of the apron top about 1/4" and press. 1. Pin two waist tie pieces together and stitch both long edges and one of the short edges. Clip corners. Turn the tube you've created inside out and press. Repeat with the other two waist tie pieces. 2. Insert the raw edge of the waist ties into the slots you left unstitched, making sure they are even with the waistband, and secure with pins. 3. Pin the two neck tie pieces together and stitch on one side. 5. Using a basting stitch, stitch along the raw edge of the middle 18", or formula (6). Evenly gather so that it is the same length as the curve of the apron top. 6. Pin the gathered neck tie in-between the two turned down edges of the apron top. Err on the side of too many pins! 7. Now you have a portion of unpinned neck tie on either side of the apron top. It has one seam on the top (at this point on the inside of the neck tie) and raw edges on the bottom and side. Turn this unpinned portion wrong side out so that the seam is now visible. Stitch the raw edges of the neck tie to within about 3 inches of the apron top. You are left with a tube, wrong side out, and a small opening next to the apron top through which you can turn the tube right side out. Do this and then press the tube. 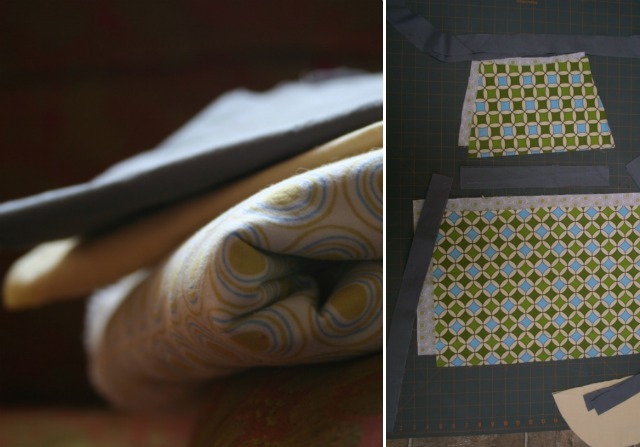 The small opening will be completely closed with top stitching in the final step. 8. You're almost done!! Top stitch around the entire apron. 9. Top stitch along one edge of the neck tie. Stitching along the edge of the waist ties is optional. If you want to add anything to the pocket or apron skirt as I did, paint (or appliqué) it on prior to sewing any pieces together. 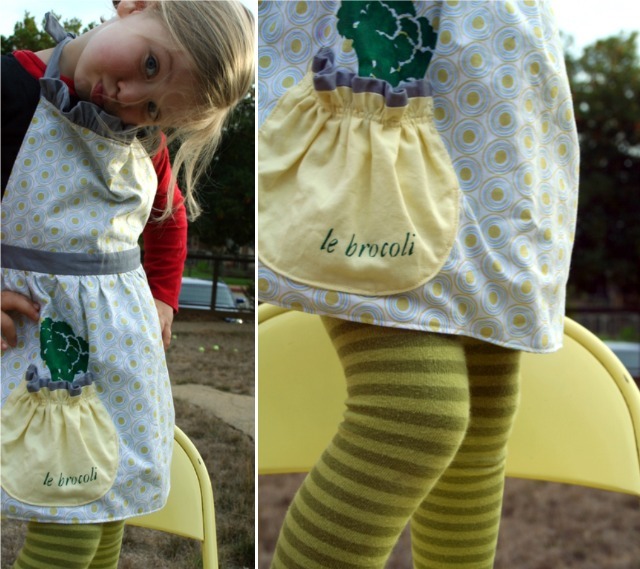 Sit back and watch your daughter romp about in her new apron. Thank you Jennie for sharing your talent and your time. This apron is perfect. If you have a DIY foodie project you'd like to share on Kitchen Corners that you think would make a good Holiday gift send me an e-mail. I'd love to share your ideas. This is so very adorable! I really like the broccoli sticking out of the pocket too. 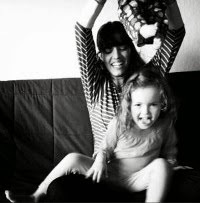 Damaris, there are few bloggers that make me want to have kids right now (I want them, but not yet), but you always make it look like so much fun. Thank you very much for sharing in so detailed. The apron looks so pretty! The cutest little thing! 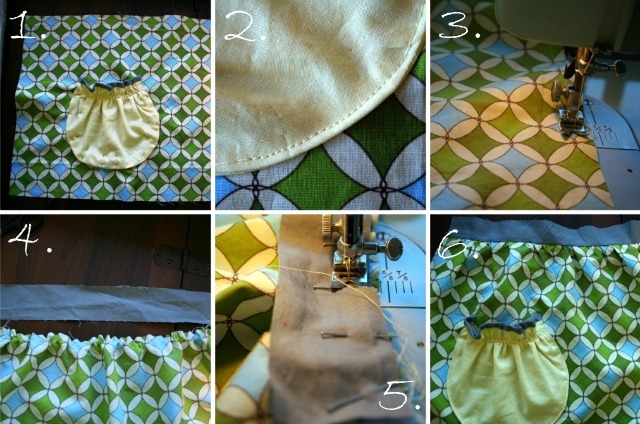 I may have to dig out my sewing machine for this one! Okay, not just for little girls - this big girl wants one!! =) Those are gorgeous! Too cute! Wish I could sew. Have a machine, took one class, but if I could get an elf to come set me up each time (ribbon, bobbing, whatever), then I'd be so happy...it's the part that stumps me every time I pull out the machine. why have i not followed KC before? I want to comment on each post..but i can't-I'm supposed to be doing science with my oldest...great job over here-you have so much amazing talent...wish CA was a little closer! So so cute! I actually just finished some simple little Christmas aprons for my boys and nieces that I'm getting ready to post soon. I love the cute pocket on this apron! But darn it is so cute, I especially like that you can have something peeking out of the pokcet. Adorable girl too! Super cute! I just recently picked up sewing! Not sure if I'm ready to tackle an apron yet ;) Hopefully soon! Too cute! I need a sewing machine pronto! 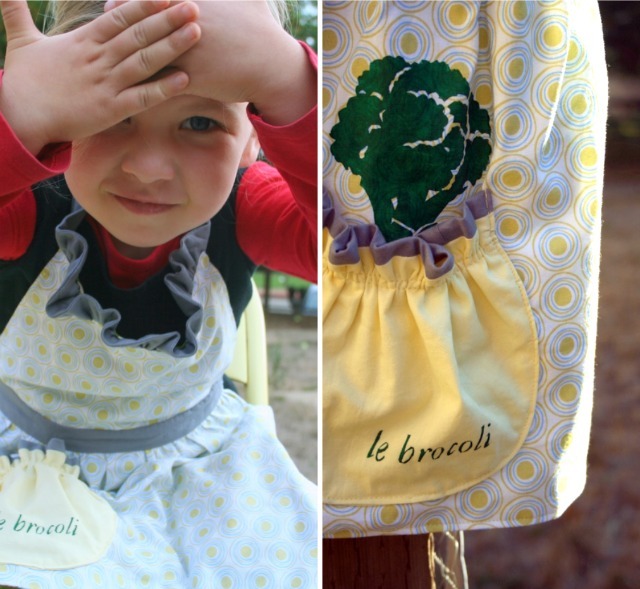 This apron is just the cutest! If I had a little girl I would totally make one for her. Heck, I want to make one for myself! Oh, yes, I really wish I knew how to sew! This is like Greek to me...but it's adorable.